Experimental art collective Yamantaka // Sonic Titan combine musical and cultural concepts from their complex Asian, First Nation, and Canadian heritages. On UZU, they expand, refine and recast those ideas anew. 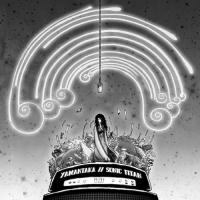 Experimental art collective Yamantaka // Sonic Titan combine musical and cultural concepts from their complex Asian, First Nation, and Canadian heritages with a Western base of psychedelic sludge and progressive rock. The band's 2011 debut, YT // ST, was largely successful, but the parts often mixed instead of melded. However, on the band's latest album, UZU, Yamantaka // Sonic Titan expand, refine and recast those ideas anew, and the result sounds like a true synthesis of their diasporic parts. In the process, they move from an interesting art project to a band to be reckoned with. One step in that process was to move from the distorted production of the debut to the brightness and clarity captured on UZU. This achieves two things. First, it highlights the newfound confidence and power of singer Ruby Kato Attwood, who proves not only her vocal strength but her ability to carry a song when the spotlight shines brightly upon her. Second, it allows for the inventive percussion of Alaska B to be heard to full effect; as the murk recedes the subtlest of fills and lightest touch of cymbals rise to the ear. This recording ably captures the core dynamic -- the pairing of soprano and eclectic drumming, both in apposition and opposition -- that is the heart of Yamantaka // Sonic Titan's sound. That dualism is also seen in the sequencing and mix of the album. It is presented as two continuous sides, allowing for each suite of songs to build and comment on the preceding piece. For example, "Whalesong" trails off with the piano line from "Atalanta" fading into the rise of synthesized waves and what sounds like a modulated tolling chime; these immediately begin to distort and build into the slow fuzz guitar and thick bass of "Lamia", while Alaska B starts a syncopated beat beneath those synthesized waves. This in its turn folds and falls into the looping high synth and rising shuffle on the cymbals that open "Windflower". On both sides of the album, the connective tissue helps less show-stopping tracks add to the overall appeal without being lost. And a song like side one closer "Hall of Mirrors" would bury them without that connection. A distillation of all the sounds explored thus far, "Hall of Mirrors" contains the expected syncopated drumming, distorted synth, fuzz guitar, and Attwood's bright soprano. However, when Ange Loft's strong rapping bursts on the scene the new voice is a shock, as no hint of this was present before; the jarring force is married to what can only be described as '70s horror movie keyboards and machine gun drumming, and the result is a change in what possibilities the band contains. This isn't just a side closer but a statement of future intent. Prepare to be unprepared. Yet nothing is as jarring, nor as fitting, as the pairing of "Bring Me the Hand of Bloody Benzaiten" and "One". The former is the most traditionally Asian sounding piece on the record, with taiko drums and tuned gongs melting and flowing as befits the goddess of water, words, and music. Benzaiten is also one of the most syncretic of Hindu deities, worshipped and adapted to both Buddhism and Shinto faiths. And syncretism is at the core of "One", perhaps the most ambitious, successful, and powerful melding of the many disparate ideas that compose the ethos of Yamnataka // Sonic Titan. "One" begins with a traditional Iroquois song performed by members of the Mohawk tribe before turning into a driving rock song propelled once again by Alaska B's drumming, while Attwood sings lyrics that question the cultural identities people take for granted. UZO is not a perfect record. There are distinctly lesser tracks, and though they work within the album they don't hold strong in the memory. What hold are the songs that feel entirely theirs, where the cultural references fuse into a new alloy hitherto unknown.